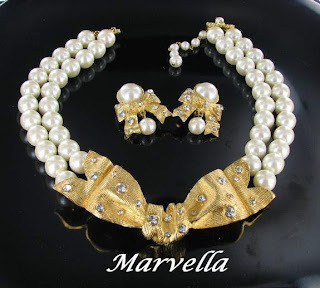 Marvella Jewelry Company is well known for their use of faux pearls and glass pearls in their designs. This week's vintage jewelry find is a stunning set from their collection which has rhinestone accents for a fabulous look. What an impression this stunning demi will make when worn! The set consists of a double strand necklace which is teamed up with a pair of matching clip back earrings. The necklace has two rows of 12mm imitation pearls with a large chunky and textured bow front with rhinestone accents and wonderful detail. It is heavy and substantial and feels great when worn. 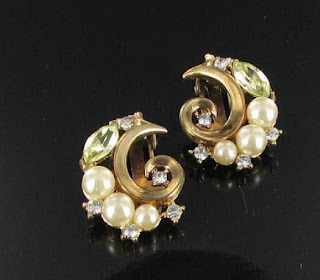 The earrings have a large pearl cabochon with the same bow design hanging below and a single pearl dangle. This is unsold dealer stock which has never been worn so would make a great Christmas present. Excellent condition. Signed Marvella on the back of the earrings and back of the necklace bow. The lovely Marvella Pearl and Rhinestone set is available from my Finishing Touch Vintage Jewelry Shop on Ruby Lane for $75. The first day of fall has come and gone and it seems appropriate to showcase leaf jewelry in its honor. I love fall. For a start, since I live in humid and hot North Carolina, spring and fall are much more pleasant to me outdoors than summer is. I find myself looking forward to fall all year long. Also, it reminds me of looking forward to the arrival of the JC Penny catalogue when I was a teenager in Maine (many years ago.) So, for me, the arrival of fall is a mix of nostalgia and heat relief! Anyone who has raked a pile of autumn leaves knows what a fabulous blend of colors and shapes you will end up with. It appears that this could have been the inspiration of many of the well known vintage jewelry designers. Most of them made leaf motif pins. 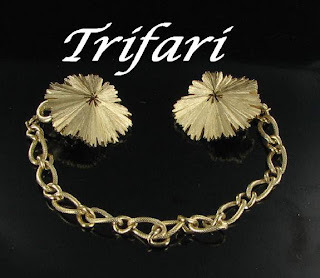 Trifari is one designer that particularly comes to mind. Their brushed goldtone and silvertone leaf pins are just full of detail. Sometimes enhanced with pearls or rhinestones, like the one shown here, and as always this designer never fails to disappoint. 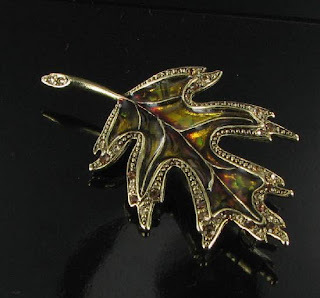 Other designers used rhinestones, pearls or colored cabochons to enhance the style of their leaf jewelry. With this technique, the sky is the limit when it comes to color. 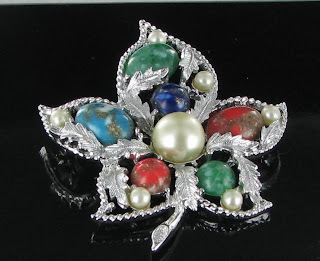 This pretty maple leaf design by Sarah Coventry, aptly called "Fantasy" uses a pretty mix of pearls and colored stones for a unique look. One of my favorite leaf designs has to come from Norway. 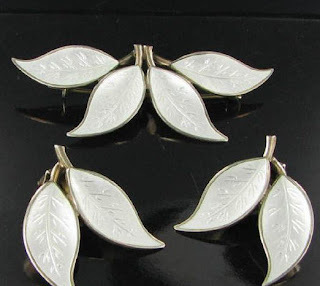 David Anderson is famous for his leaf designs set in basse-taille enamel and sterling silver with a gold vermeil wash. They are simple and elegant and very collectible. This pretty demi is a good example of this technique. 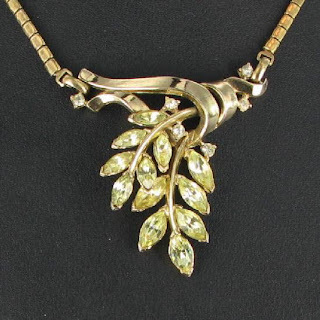 If you like nature jewelry, be sure to visit Vintage Jewelry Lane and Vintage Jewelry Mall for more great choices like the ones shown here. You can also click the pictures shown here for more details about these items. Furry Cat Pins are a Hit with My English Customer! I recently came across a group of cute little cat pins in a large estate collection that I purchased. The were all very similar and were made of fake fur and hand done with red felt backing and a safety pin clasp at the back. 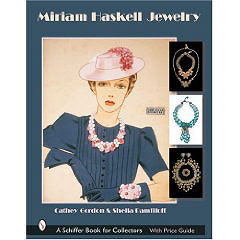 I listed them all in my Carolina Collections Vintage Jewelry shop and they all sold to customers in England, but one customer purchased 3 of them - all exactly the same, and one at a time. When I sold the last one to this customer, I showed the pin (featured here) to my husband, who is English and told him that they all sold to English customers. He just added in his (not a man of many words) way "English people like cats." When I was notifying my customer of the shipment of the last pin, I added a note to my email saying that I had noticed that she really liked the kitty pins. We exchanged a few emails and she told me the story of her love for them, and agreed to let me share it with my readers. Apparently, she has a whole collection of them! Melissa, from England, has several of these furry critter pins and she tells me that people stop her in the street when she wears them to ask questions about the pins. 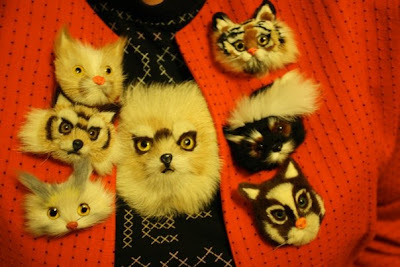 Here is a photo of her collection all on one sweater. It is quite a look, but she assures me that she only wears them one at a time! You can see my kitty on the top left in her photo. She told me that the first one that she received was a present from her then boyfriend, who purchased it at an antique fair. The pin was similar to the tiger cat on the right of her photo. She loved the pin and they called it, simply, "cat." 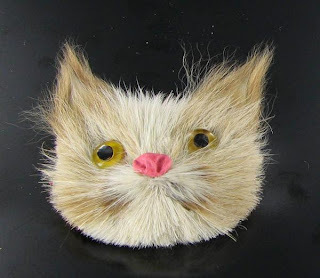 She wore cat one day on a date with her boyfriend, and when she returned home, she put the T shirt inside out in her washing machine, with the pin hiding in the folds, and accidently destroyed her beloved brooch. You can imagine that her eyes bulged right out when she found his little white hairs everywhere but no bodily remains to be found. After a bit of panic, and a bit more searching, she found just his two little eyes, all alone in the bottom of the machine, staring up at her - so forlorn looking. Of course, lots of sobbing followed with thoughts of never finding another kitty like "cat." However, about a year later, she found an almost identical one on ebay and purchased it. The cat was hers again! Within a week, she found a wolf, and this started her hunt for more of these furry critters. She has told me that most of them were found on ebay, and most came from American jewelry sellers. Mellissa was recently in a vintage store in London and a woman exclaimed "oh my god, you're the girl with the things!!' because during here previous visit her boss had called over all the staff to see Lionface (the huge one). She says that she doesn't need to travel more than a few streets or shops in London before she gets asked about the pins. It is such a delight to know that my kitty pins ended up in the hands of such a lovely collector. Thanks for sharing your story with me and my readers, Melissa! Do you have a story about your jewelry that you would like to share? Please email me and I'll be happy to feature you in a future blog post. 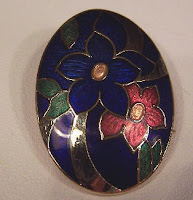 Today's vintage jewelry word is cloisonné. This is a process in which enamel is applied to metal, by first outlining the metal surface with gold or silver wire into a specific design. Then, the space between the wires is filled with enamel and fired to a highly polished, glassy sheen. It is considered a very high grade of enamelling. Cloisonné comes from the French word which means to be compartmentalized, to be cut off from one another, to feel cut off, or shut out. It is pronounced clwa-zoh-NAY. The Japanese are very fond of cloisonné designs. In Japan the word is called "shippo" which means the seven treasures gold, silver, lazuli, coral, amber and agate, although cloisonné designs do not have all these materials. 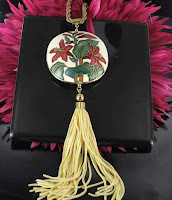 Cloisonné is not a word which pertains just to jewelry manufacturing - it is also used in other decorative ways. 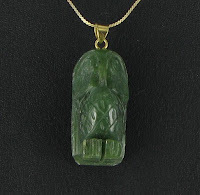 It thought to have first been used in either ancient Persia or Egypt. Many researchers believe that it was used in Egypt before 1800 BC. The technique was imported to Japan in seventh century. There is also evidence that the earliest Chinese cloisonné designs were made in the Yuan Dynasty (1271-1368). The best was made during the Xuande period (1426-1456) of the Ming Dynasty. Today, cloisonné designs are considered one of the traditonal arts and crafts in Beijing, China. The making of cloisonné requires quite an elaborate and complicated process. It involves base-hammering, copper-strip inlay, soldering, enamel-filling, enamel-firing, polishing and gilding. In spite of this lengthy process, most cloisonné designs are moderately priced. Many cloisonne designs feature flowers and butterflies. If a variety of enamel is used, the piece has a very colorful finish. 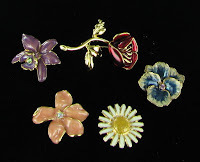 Here are some examples of vintage cloisonné jewelry pieces. What do you think of the look? You can click the pictures for more details and prices. They are all for sale in my online shops. This blog post is another in my series about choosing jewelry suitable for individual star signs. Today's astrological sign is Libra, which is the sign for those born between September 23-October 22. The sign is depicted as a scale and it is an air sign. Those born under the sign of Libra are said to be diplomatic, romantic and charming. They are quite perceptive and intuitive. On the negative side, it is thought that they can flirtatious, and overindulgent. Thinking about buying jewelry for your Libra friend and don't know where to start? Let's examine some of these zodiac facts for a bit of inspiration. Since Librans like roses, daisies and strawberries, how about one of these two choices? You can click any of the pictures for more details and prices. Perhaps one of them is just right for your libra friend. 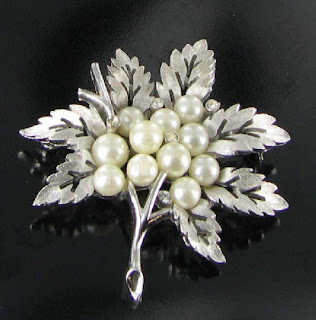 I love a piece of jewelry that can be worn more than one ways, such as a brooch which will double up as a pendant. So, finding this sweater guard was a real treat for me, since it is a combination piece I haven't come across before. The sweater guard was popular during the 1950s and 1960s when two piece sweater sets with a knit top paired with a cardigan sweater were very popular. Wearers would join the opening of the cardigan at the neckline with these sweater guards so that the underneath top would show. They are quite collectible now, and can be worn at the neckline of a pretty blouse by attaching it at the tips of the collar. The piece is made by Trifari and features two clip back earrings in brushed goldtone which are joined by a textured link chain. It can be worn as the sweater guard, or simply remove the chain for a set of earrings to wear on their own. Double duty in a matter of seconds! 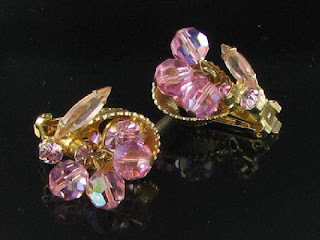 The clip is available in my Ruby Lane Shop - Finishing Touch Vintage Jewelry for only $22. 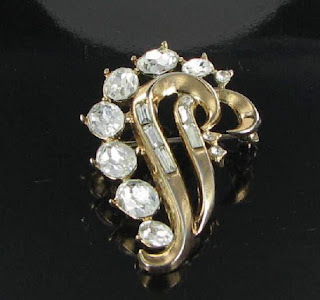 Today's vintage jewelry word is solje. Solje jewelry is a particular style which is the traditional national jewelry of the Scandinavian country Norway. The jewelry normally consists of a setting of sterling silver from which hang tear shaped "spoons" in either silver or gold metal. The background piece will often have an interesting edge design, such as a crown, or a scalloped surround. The piece normally has a repoussé finish. Many of the pieces are marked 830s, or 830s Norway which is a hallmark for the metal content (similar to 925 for sterling silver). Each region of Norway has its own style of Solje. Solje pieces were used, at one time, to add accenting to the traditional Norwegian costumes, which are called Bunads. The Solje pieces were meant to represent the sun, and were worn on collars and cuffs, normally as brooches and pins. 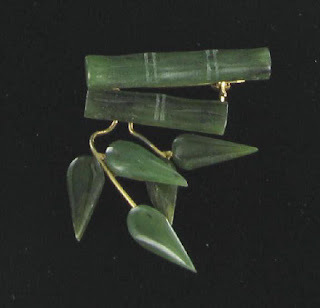 It was not unusual for a Norwegian woman to wear three pieces of this jewelry at once - one at her throat, one over her heart and another at the bodice opening. The art has evolved over time so that one can now find earrings, necklaces and other pieces of jewelry in the Solje style. 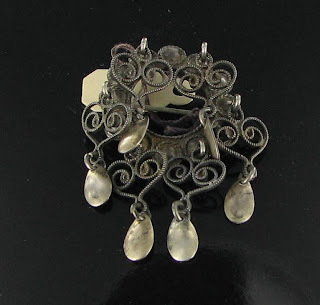 Pieces of Solje jewelry were often given as wedding presents, for Christenings and other special occasions, etc. The size of the piece of jewelry is a good indication of the use that it may have had. 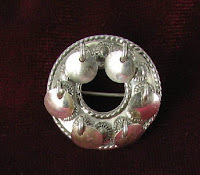 Smaller pieces up to about 1" in size, such as the circle brooch shown here, were probably given as gifts to babies and children. Larger pieces were more likely worn by women. Since Solje jewelry is traditionally made from silver, it will tarnish over time - sometimes quite heavily, although this gives it an aged patina that many vintage jewelry collectors appreciate. This is an example of a piece of solje jewelry with a very dark patina. The tarnish is so strong that, at first, I couldn't make out the 830s mark on the back of the piece. Notice how the setting has much more of a patina than the "spoons." This seems to be the case on most of the Solje jewelry that I find in estate collections. Some care in storage and cleaning will be required if you wish to keep Solje jewelry looking fine. The first step in the procedure is storing your Solje jewelry in the original box if possible. If the original box is not available, store the piece in anti-tarnish paper, bag or cloth and place in an air tight container such as a zip lock bag, to reduce tarnishing. I have read many articles discussing the polishing of Solje jewelry and most of them recommend a silver dip. I don't believe this is a good idea, since these are often very harsh and the settings of Solje jewelry can be quite delicate. My advice is to use sunshine cloths if the tarnish is not too great, or a cream style of silver cleaner and a soft, clean cloth, such as a piece from an old soft cotton T shirt. If your piece of Solje jewelry becomes dirty over time, a gentle soak in a mild detergent and warm water should do just fine. Be sure to dry it thoroughly before storing the piece. As with all jewelry, when you wear your Solje jewelry, put it on after using hairspray or perfume and this will decrease the likelihood of tarnish. With a bit of care, you will be able to keep your Solje jewelry looking good for years to come. 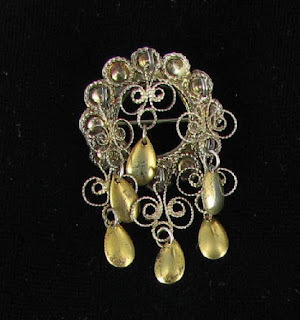 This week's vintage jewelry find is a lovely demi parure by well known designer Jerry Fels, also known as Renoir of California. 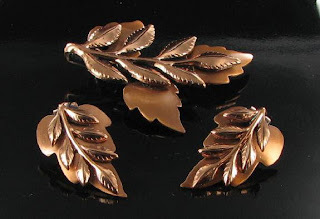 The design is called Laurel, and is popular in both the copper set (shown here) and the enameled versions. It is simple and yet very effective in design. Circa mid 1950s. The size of the pin is 2 1/8 x 1 3/4" and the earrings are clip backs and are 1 1/4 x 3/4" in size. Signed Renoir © on the back. The pieces are shown in the Burkholz book called Copper Art Jewelry on pages 86 and 132. Craft Lots, Junk Jewelry Lots, Pounds and Pounds of broken jewelry. I see this type of thing offered on ebay all the time. These lots are often full of broken jewelry, or worn jewelry of bits and pieces of old jewelry. Do you ever wonder what people do with the large lots of jewelry sold on eBay and other auction sites which are titled as craft jewelry? So did I so I started looking around the net to see what other people do with odd ball jewelry that isn't saleable in its own right. 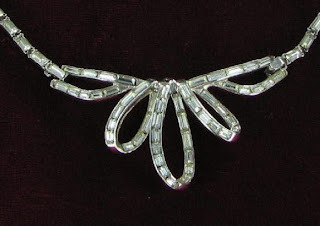 Some people buy jewelry lots like this simply to harvest old vintage findings and rhinestones. 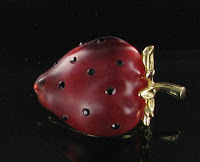 Since vintage jewelry is old and clasps and stones are no longer available for sale, it can be a daunting task to get just the right stone or clasp to repair a piece that is otherwise sound. But the use of craft lots doesn't stop there. There are so many creative uses of jewelry that arty people have come up with. 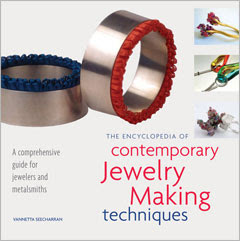 About.com has an interesting article about various uses of jewelry for crafts. Here are some other ideas. Perhaps they will spark your creative juices. If you have other ideas, I'd love to hear about them in the comments section. Take a plain picture frame and add fronts of vintage earrings or pins around the edge to make a sparkly jazzed up picture frame. Sparkly strands of vintage beads draped around a pottery piece can add an eye catching look for a center piece. Use old vintage jewelry to jazz up a tablescape for your next party. 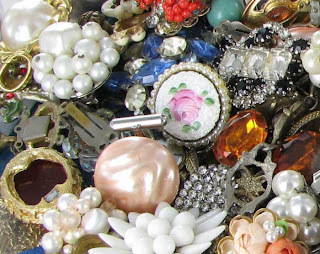 Decorate the outside of a plain jewelry box with vintage baubles. 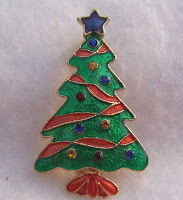 Use old pices of rhinestone and glass jewelry to make one of a kind Christmas mosaic tree to decorate for the holiday. An example of the Christmas tree idea is shown in this YouTube video that I recently found when looking for craft idea. I get loads of this sort of jewelry in the estate collections that I buy. I just stick it in a box in the corner of my sorting room and when it's full, I put it on eBay. 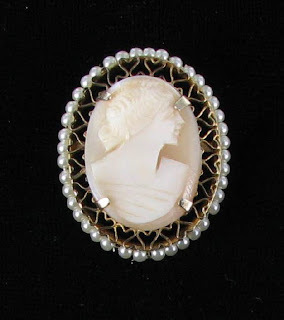 Be sure to check out my store Carolina Collections Vintage Jewelry. I often have this type of craft collection for sale.